You already know you need to have your cholesterol checked regularly. If you have a sweet tooth, you may need to know your triglycerides numbers, too. Catherine McNeal, MD, PhD, Internist and specialist in lipid disorders at Scott & White Healthcare, details how a high triglyceride count can be a marker for a lifestyle that leads to serious health problems. “Triglycerides are one of the two lipids, or fats, found in your blood. Cholesterol is the other lipid. Whereas cholesterol comes from the fatty foods you eat, triglycerides are metabolized and are the byproducts of the sugars and starches you eat,” says Dr. McNeal. The more sugary and starchy foods you consume, the greater risk you have of developing high triglycerides. Leftover calories not burned off by exercise are converted by your body into triglycerides and stored in your fat cells. In some cases, a high triglyceride level may be genetic and not dependent on your food consumption, Dr. McNeal says. Triglycerides are a good measure of your overall health. Sometimes just a few of these features are present, but having at least three of these problems markedly increases your chances of developing type II diabetes mellitus and increases the risk of developing coronary artery disease, Dr. McNeal says. “In this case, a high triglyceride level is usually due to poor lifestyle choices, that is, not being active enough and/or consuming too many calories, which can then lead to type II diabetes and heart disease,” Dr. McNeal cautions. How Do I Lower My Triglyceride Levels? Having high triglyceride levels doesn’t have to be a permanent state. “With exercise, after you burn glucose, you burn triglycerides as fuel. That’s how exercise lowers your triglycerides,” encourages Dr. McNeal. For people with severely elevated triglycerides or with type II diabetes and high triglycerides, especially women, a class of drugs called fibrates may be recommended. How Do High Triglycerides Affect the Total Cholesterol? Dr. McNeal urges caution when interpreting results of your lipid profile, as high triglycerides can affect your total cholesterol count. 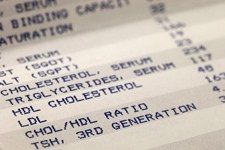 What Is the Biggest Risk with High Triglycerides? “People with ultrahigh triglyceride levels generally don’t have a higher risk of heart attacks and strokes. Their biggest risk when triglyceride levels are above 1000 is having pancreatitis,” says Dr. McNeal. Uncontrolled diabetes mellitus and alcohol are the primary contributors to high triglycerides leading to pancreatitis, a potentially life-threatening condition. If you’ve had a lipid profile that indicates high triglycerides, eliminating or significantly reducing sugared beverages and alcohol is strongly advised. What Medications Raise Triglyceride Levels? If you are taking one or more of these medications and you have high triglycerides, discuss their use with your physician. The American Heart Association recommends a fasting lipid profile for all adults age 20 or older every five years. Your triglycerides are 200 mg/dL or higher. You are over age 50. You have other risk factors for heart disease or type II diabetes. Previous Previous post: Is Soccer Hurting Your Ability to Think?